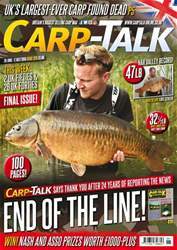 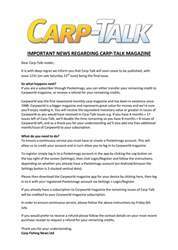 This week’s bumper summer Carp-Talk (issue 1031) is available to download now. 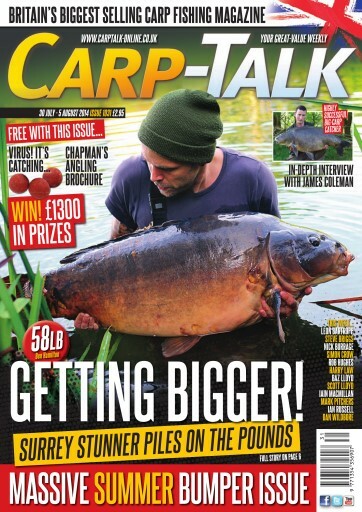 In this week’s action-packed issue, highly successful Sussex big-carp catcher James Coleman talks to Paul Monkman; Ian Russell is fortunate enough to get a test session on Monument 2; Steve Briggs rejoices the wonders of Glorious Grenville’s; and Nick Burrage hopes to creep up on a margin monster. 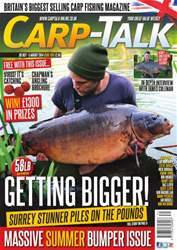 Mark Pitchers demonstrates a simple tactic that has continued to help him land wary carp; Rob Hughes examines how we can improve our catch rate by being stealthier; 10 Tips For Surface Success with Team Korda; Leon Bartropp heads off to the Isle of Wight for a Combley Break; Harry Law advocates some Midweek Magic following a session at Thorney Weir; Simon Crow recounts one of the finest week’s fishing he’s ever experienced. 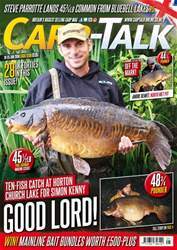 The Fox-Mainline Carp Angler of the Year competition continues, and you have the chance to win prizes totalling £1300 including great new products from Korda, Cygnet Tackle and Sonubaits.